Jigarthanda starts with a man parking his bike before a gate of a bar/theater, where Sivaji’s Malarum Malaratha song is being played. Four people surrounds him and this guy gives them a casual look, these four guys tells him something and starts shooting him. Until, this frame the entire sequence looked beautiful but soon after that, four dudes who shot the guy are looking weird- without subtle sharp reaction. Normally, this won’t happen in a good director’s film and I was shell-shocked, as I have high regards for Karthik Subbaraj as a great filmmaker. Later in the climax, we are shown that the entire sequence is a film shoot and the guy who gets shot is Siimha. We are also shown that director Vetrimaran is filming this particular scene, the next question is that does a good film maker like Vetrimaran won’t notice those four weird dude and correct it? , then I realized that the shot was kept for Siimha in the film and hence the four dudes looking weird won’t affect the scene in any way. Well, this minute episode is more than enough to say that Karthik Subbaraj is an intelligent film maker. Take any gangster film, there will be a super star or well known actor who used to be either a powerful protagonist or antagonist. Directors will normally sketch their characters in such a way that they overshadow the script. Take Nayagan(Kamal), God Father(Al Pacino, Marlon Brando, Robert De Niro), Puthupettai (Dhanush) as examples, after watching the movie the immediate reaction from the audience would be “What an acting by the actor, man he stole the show”. Of course, later people will think and discuss about the novelty of the script and the making but the immediate reaction will be on these stars. In Jigarthanda you will praise Siimha for his stellar performance, you will praise Siddharth for his subtle innocent act and stunning transformation in the climax but before that you will praise Karthik Subbaraj for the excellent script writing and making, to be precise Karthik got exactly what he wanted from his actors for the script and they are not portrayed as legends/heroes who are better than the script itself. There were reports that Jigarthanda is a copy of Dirty Carnival, though I haven’t seen the film my friends who watched both the films told me that, Dirty Carnival might be an inspiration but Jigarthanda is definitely not a copy of it. If Siddharth was shown as an assistant director/ a director then many of our over enthusiast people would have outraged Karthik Subbaraj by saying that Jigarthanda is a copy of Dirty Carnival. Intelligent Karthik Subbaraj used his ‘Naalaya Iyakunar’ program in the film and the character Karthik is shown as one of the contestants. Also, our own Soodhu Kavvum Nalan Kumarasamy was shown in the program and when Siddharth meeting the producer who gave him chance, we are shown Attakathi poster in his office. Remember? CV Kumar’s second film is Pizza and first film is Attakathi, without answering to every one’s question on whether Jigarthanda is a copy of Dirty Carnival, Karthik has kept all these scenes to say that this is his own story. In one of his media interactions, he has said that Jigarthanda is his own experience and these scenes are the way to explain that the film’s story is his own experience. As I said earlier, Siimha’s character is not shown as a legend or hero. He is shown as an ordinary guy who has became a don but then not up to the level of Velu Nayagar, God Father or Kokki Kumaru who are shown as intelligent dons. Here Siimha has his powerful essence but he is shown like any other ordinary human being, the rustic-ruthless Siimha is shown only when he is angry, otherwise he is a normal guy. For example there is a beautiful Tarantino kind of scene – There is rain and Siimha approaching the washroom- he gets a plate for not getting his hair wet, the sweeper wishing him and asking for money, the sweeper also tells him that he has just cleaned first toilet, hence suggest him to use the particular one, not just once but stressing him again and again. When Siimha is trying to use the particular toilet, a drunkard signaling him that he has reserved the toilet and keep on vomiting. Had it been any other film, the don would have beaten the drunkard. When Siimha finds another toilet, the drunkard is also entering the first toilet room and he is getting murdered by repeated bullet shots, the murderer shouting “die Sethu die” and also confirming to some other guy in phone that he killed Sethu but he looks lean now. All these time, Siimha watches the whole thing helpless with a frighten reaction. When Siimha’s gang reach the spot, the murderer satirically ask them to see the thing happened to Sethu(Siimha), the gang staring at Siimha(without uttering any word) and then the murderer understood that he wrongly shot another guy. When Siimha understands that there is no bullet in the murderer gun, he silently enters into the toilet. Had it been any other film Siimha’s character would have bashed the baddie. Similarly if you carefully watch the film, Siimha beats very rare only during the important portions otherwise his side-kicks will do the things. That’s how a leader / real don will be right? Also, while finding the spy inside his gang it is not Siimha who finds the transmitter inside the mp3 player and he don’t have any clue about it, Sundaraja character explains him that someone is listening to all the things which were happened and happening in that particular, then only Siimha reacts to the situation. This is what we call as honesty in sketching a character. During Siimha's life story narration to Siddharth the way Karthik Subbaraj used Vijay Sethupathi playing Sethu’s(Siimha) character in Karthik(Siddharth)’s imagination is a novel stuff. Again, in the climax, Siddharth approaching Vijay Sethupathi for a film where he should play a don role, remember? Azhuguni Kumaru is a comic film and Siddharth is yet to film a gangster movie. Also, we were never shown whether Lakshmi Menon and Siddharth marry each other but soon after a phone call, Siddharth tells Vijay Sethupathi that his wife Kayal(Lakshmi Menon) is a big fan of him. Similarly towards the climax, the shot were Siddharth was kneeling down in a vast land and the camera moves from the bottom of a car (reminded me of Se7en climax shot), in that scene Siimha was actually changed but Siddharth on the other hand will be having a gun, which says that the duo have interchanged their characteristics. This interchange is also continued in the climax too, there is a scene where Siimha asks the daughter of his gang-member (whom he earlier murdered) to call him 'Appa' which indicates that he has changed and taking care of the affected family. Similarly Siddharth on the other hand threatens Vijay Sethupathi with Siimha’s ex- gangsters. Also, during the last meet up of Siddharth-Siimha , Siimha asks Siddharth for Mani Ratnam’s number and during the climax shot, he tells a guy that he want to act in Mani Ratnam’s film. These minute details are the biggest asset for a cult film and Karthik Subbaraj has come out with flying colors. Coming to the negative aspects or the thing which didn’t appeal to me is that the whole lengthy training episode. Instead of training episode, if Karthik Subbaraj concentrated more in portraying how Siddharth filmed the comic Azhguni Raja by cheating Siimha then the film would have been more interesting. Also, while watching Azhuguni Kumar we are shown that audience watching the film are laughing but we don’t feel anything. If Karthik Subbaraj portrayed those scenes in detail, we would have got better impact and an emotional connect would have been established but now we couldn’t enjoy Azhuguni Kumar visually, all we hear is people saying it is a cult comic movie. I can’t complete my write-up without mentioning about Santhosh Narayan’s background score, easily this is his best till now. He maintained silence wherever needed and spilled his magic in required situations. The pre intermission portions, climax just gave goose-bumps to me. Also cinematographer Gavemic U Ary ‘s work is breath-taking. The interval shot in rain, the shot where Siimha puts Leonardo Di Caprio’s mask and kills his enemy with Kate Winslet mask, the climax shot in the vast land are pure gem. 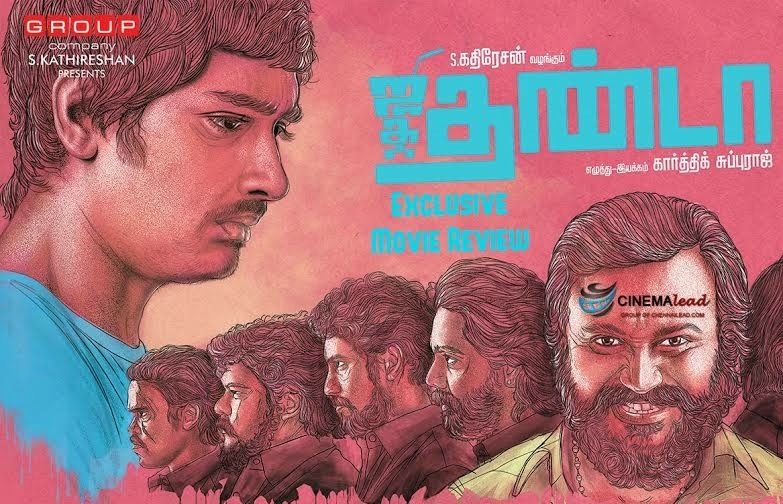 Overall, I loved Jigarthanda and it is a gutsy- experimental film.